For much of the discussion in the industry, it appears that the computing revolution is one where war is being waged on two different screens: mobile phones and tablets. But the reality in the consumer world is that the space is still one where two extra screens have high relevance: the computer screen and the TV screen. Computers, while they are increasingly being replaced by tablet computers, still have a majority position in the way people interact with a lot of interactive content. Witness, for example, how most teenager or college-age students are watching video or listening to music and you quickly realize that something with a screen and keyboard is still important in a lot of people’s lives. Similarly, the TV screen provides a large screen experience that tablets and smartphones cannot match. This is why companies like Apple, Google, and Microsoft are working very hard to provide technologies that can send information from a smart device to a TV screen. Today, this still requires some form of proprietary receiver to be attached to the TV set but one can see this eventually becoming embedded technology in screens. The growth of mobile and tablet devices has shown the need for deep integration between hardware and software to create a complete experience that will resonate with users. Apple was the first to advance that notion and has managed to reinvigorate itself as a company through its amazing integration and its ability to design a supply chain approach that cannot be matched by any of its competitors at this time. The real genius of Tim Cook, and probably the reason for which he succeeded Steve Jobs at the helm of Apple, is his ability to understand how streamlining each piece of the integration puzzle gives the company a long term advantage. Apple’s competitors, meanwhile, failed to fully grasp how essential that type of integration was and due to either their inability to understand the end to end model or their unwillingness to break with the past, ended up saddled with legacy systems that did not interact too well. Witness, for example, the early efforts of Microsoft in the space, as it initially tried to graft the PC experience of Windows on mobile devices. 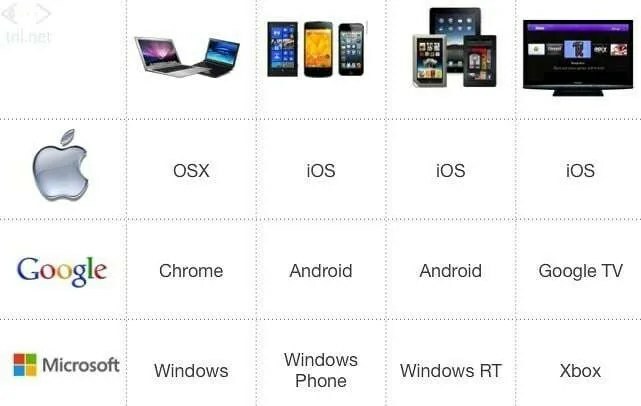 Or look at the way Google has created separate offerings for PCs, mobile devices, and television. Apple, Google, Microsoft all take different views on how to tackle the four different screens of our times. So now, looking at how they are approaching things, it becomes clear that there are still internal battles to be fought within each organization and difficult choices to be made by the leadership of each company. Apple is the first interesting case to look at on this chart, as it needs to get serious about AppleTV and assess how it will transition from OSX to iOS in the future. AppleTV has long been claimed by the company to be a hobby but it is the Cupertino’s giant’s gateway to the living room. Without it, Apple is missing a key piece of the puzzle and cannot become the long term dominant force it has the potential to be. Today, the device is a relatively dumb box but I suspect that future upgrades will see it as a new platform to deploy to from the Apple app store. The key to this will be increasing the memory footprint of the device so it can receive and store content and applications. I would not be totally surprised to see them introduce a 16Gb, 32Gb, and 64Gb version of the AppleTV next year, as a result of this thinking. Meanwhile, the company has been reluctant to tell its user base that OSX does not have much of a future but reading through the tea leaves, it has become increasingly clear that the roadmap of OSX eventually leads it to be eaten up by iOS. This could mean throwing existing mac developers under the bus but it is not without precedent at Apple. When OSX itself was born, backward compatibility with Apple’s previous iterations suffered and many complained at the time. Viewed with the benefit of hindsight, it is clear that it was the right decision for the company and that it made sense in order to allow it to move forward. In the same way, when Apple announces that OSX is dead and will be replaced by iOS X.0 (where X.0 may be a double digit number), the decision will lead to many people screaming bloody murder even though the path is the correct one. For comparison’s sake, you can look at the other side of the computing world right now, with Microsoft making that very transition as we speak. The release of Windows 8 has considerably streamlined how Microsoft presents itself to its user base. Windows 8 is the name of the new OS and it comes in different form factors (why Microsoft actually decided on different nomenclatures for each platform is, however, a question that still puzzles me). But with that transition, Microsoft is going through a lot of creative destruction. While it still supports existing Windows software (hence the compatibility mode that allows for two different types of desktops to exist in the Windows 8 world, leading to much confusion), it is clear that the company is not looking back that much. That Windows 8 is essentially unusable on an older PC speaks to the fact that the company is throwing its lot with touch interfaces as the future. However, they have been disingenuous in failing to tell end users that upgrades were possible: to upgrade a computer without touch input to Windows 8 is an exercise in frustration: you know you want to touch the screen (the interface truly calls for it) but you can’t because your hardware won’t let you. So for Microsoft, the battle is going to be to keep holding its ground while people with older computers are phased out. The success of the OS hinges on that and, truly, the success of the company in that space as it has already reached large levels of integration across its platform. Today, the same code base powers PCs, phones, and tablets and future versions of the Xbox will have to align with the program in order for Microsoft to continue playing successfully. Microsoft has established itself as a dominant player in the living room, with millions of Xboxes already in place and a continuous growth curve that shows it is serious about that space. Back in the 1990s, the company tried to make a play for the living room through its acquisition of WebTV and over the years, it has attempted to become more of a digital hub. With the release of Windows 8, an interesting change is that the company has not been marketing the OS as one that could connect to TV set: this seems to indicate that Microsoft now sees the Xbox as its horse in the living room race. Today, it is possible to develop apps that run on Windows PC, tablets and phones but few people have also realized that it is possible to reuse much of the same codebase to run within the Xbox live marketplace. At this point, while it appears to be coming from behind (and it is substantially behind in the mobile and tablet space), Microsoft appears to have made a number of right breaks with the past that could allow it to leapfrog the competition. The main challenge it will have is in getting heard by developers as it attempts to recapture their attention. But what about Google? Why did I not mention them ahead of Microsoft? Well, truth be told, Google has a strong position in the mobile space because it went with a pricing strategy (free) that led many of the cost-sensitive integrators to use it. But along the way, the company has had difficulties presenting an integrated model. While it is the late entrant to the market, it has done so with not one or two operating systems, as its competitors were saddled with, but three: one for PCs (Google Chrome), one for mobile devices and tablets (Android), and one for television. The net result is that the company does not appear to have an integrated strategy for developers. A third party developer must choose between developing in HTML5 for Chrome, or two different flavors of Android for Google TV and/or tablets/mobile devices. Because it has a lot footprint in the PC and TV world, however, the company has a chance to fix that mistake quickly if it wants to. The first point of integration would be in aligning the releases of Android on GoogleTV, Google tablets, and Google phones and forcing its integration partners to move in lockstep with those schedules. This would provide the company with a much less confusing picture as the experience from one Google-powered device to another would be consistent. Today, Android devices from HTC, Samsung, and Motorola have radically different user experiences, something that is great for vendor differentiation but not so good for overall integration. A good way for Google to fire up its integration effort between its Android platform and its TV offering would be to leverage a piece it has largely ignored in its Motorola acquisition: Today, Motorola is one of the largest manufacturers of set-top boxes for cable and satellite TV companies. If Google were to look at this asset as its growth path into the living room, it would realize that it has something that not only rivals Microsoft’s Xbox in terms of footprint but also dwarfs what Apple has done there. Looking at this asset and figuring out a roadmap that leads to those boxes being merged into a smaller set of offerings all running Android TV would make sense. The next step is for Google to decide what it wants to do in the PC space. The Chromebook, as interesting as it may be as an experiment, represents an island of development that leaves it in a space where it is totally reliant on the web for its future. This is ground that has already been thread by the likes of Sun (now an impoverished division of Oracle) with its network computer. Furthermore, because the computer operating system from Google does not allow to run Android app, to seems that developers will mostly ignore it as developing for a standalone platform is not as efficient when one has a chance to develop for several platforms at once on competitors’ frameworks. It is clear that the three biggest players in the field have a fair amount of work to do in order to move forward. On the hardware end of things, they will eventually all reach parity as each platform adds the missing pieces it needs to compete. Where things get more complicated, however, is the partner management arena. For Google and Microsoft, this will be quite a challenge as their need to make it clear that straying too far away from the party line when it comes to the user experience of the operating system is not OK. To a large extent, Microsoft has made the leap with Windows 8 and Windows Phone 8, one that has left a few partners grumbling but also forced them to look at how they could innovate on the hardware. Expect a continuing explosion of innovation on hardware to result from this, as more and more manufacturers look to differentiate on that end of things. Meanwhile, a number of consumer electronics manufacturers have to worry about the impact of such offerings. Companies ranging from Panasonic and Samsung, with their respective smart-TV offerings, to Sony and Nintendo, with their game-box/media centers should be concerned about the introduction of new major players in the space. For them, there are two possible strategy: align themselves with one of the major players or, in the long run, die as irrelevant brands. It’s a tough choice and a few of them have already made the jump on the mobile platform (Samsung, for example, plays with both Android and Windows, while Sony has Android devices and Microsoft-powered PCs on the market) and it is one that they will have to make in the TV space eventually.